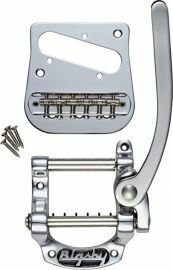 The Fender Bigsby B5 Telecaster Mounting Kit Chrome is designed to give your Fender Telecaster a new look and an extra shot of classic. Bigsby tone with the dutifully hand-crafted Bigsby B5 Fender Telecaster Vibrato Kit. This polished aluminium vibrato opens up a whole new variance of sound on the traditional solid-body, giving you new tonal dimension with pure Tele twang.